On June 14, 2017, the Mopac Mobility Bridges opened to the public. This project was a joint federal, regional, City of Austin, and TxDOT partnership. The project adds approximately two miles of bicycle and pedestrian lanes to the City's Urban Trail network. Improvements to this corridor were identified in the Austin Strategic Mobility Plan, the Bicycle Master Plan, and by the 2007 Mayor’s Street Smarts Task Force. The Mopac Mobility Bridges are located in southwest Austin from Tuscan Terrace to Gaines Ranch Loop. There are a few access points depending on where your location. You can park on the southbound side of Mopac, near the Gaines Creek and Twin Falls Access Point. If you're headed north, you can also access the trail from the 290 Service Road, near the Best Buy and Sam's Club. If you're headed south, you can start at Tuscan Terrace. Click the map below for more information. 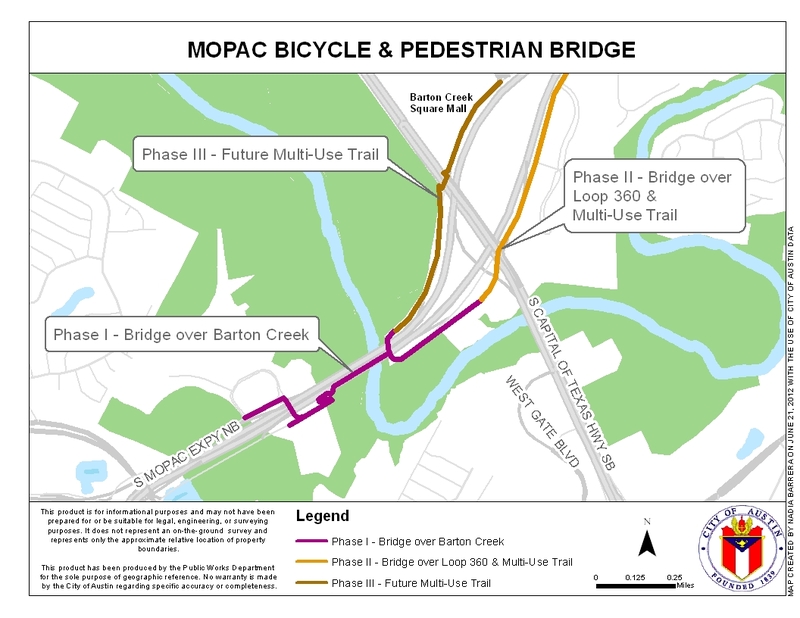 A new bicycle/pedestrian bridge over Barton Creek at MoPac, the restriping of the southbound lanes of MoPac at the bridge over Barton Creek to improve motor vehicle congestion, and improved bicycle and pedestrian connections to Southwest Parkway, Loop 360, and other planned trails in the area (the Violet Crown Trail and the Oak Hills Neighborhood Trail System). A bicycle/pedestrian bridge over Loop 360 at MoPac. A multi-use trail that accommodates bicycles and pedestrians on the west side of MoPac from Loop 360 to Tamarron Boulevard. Year 2000, 2006, and 2010 bicycle-specific bond funding. All phases are within the Texas Department of Transportation (TxDOT) right of way. Janae Spence, Urban Trails Program Manager, Janae.Spence@austintexas.gov, 512-974-3159.